Before I go any further, I feel obliged to point out the new News Post. Head on over to learn about our newly released game: “Zombies Are South!“. With that out of the way, as I mentioned last time, I had the opportunity this year to head over to the Game Developer’s Conference and check out what it was all about. It was a cool experience, and my first time attending the conference. Between the Play booth, lectures, awards ceremonies, and the Expo booth there’s a lot happening at GDC so I thought I’d take some time to share with you my impressions of this week-long event. Being new to GDC, I didn’t really know what to expect. My only real convention experience has been with the Ottawa International Animation Festival (OIAF)… which as I came to learn, there are subtle differences between Festivals, Expos, and Conventions. But for me, it all got off to a start last Tuesday. I’d decided that since this is a prime place for me to network, I should do it in any way I can. Remembering the unused Street Pass feature on my 3DS, I charged up its batteries and … wait … what’s this? Looks like Nintendo was promoting GDC too! 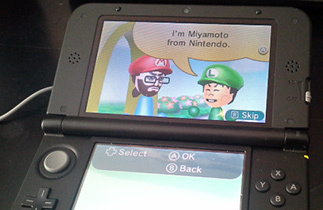 I got passed by Miyamoto! I hadn’t even gone to the convention and already my GDC was off to a good start! I headed off to the convention center and went through the process of getting my Expo pass. What’s an Expo pass? It means, essentially, that you’re excluded from being able to go to the vast majority of lectures that happen at GDC. Passes can be rather hefty, and while many people will get their All-Access passes taken care of by whichever company they work for, that just wasn’t in the cards for me. It does however allow for a very limited number of lectures, access to GDC Play, and access to the Expo and Career fairs… both of which don’t open the first day. GDC Play is open on this day though. GDC Play was essentially a section of the center devoted to showing off in-progress games from indie developers. Awesome right? The booths were pretty straight forward: computer, poster, and enough space for some business cards. Simply walk around and let your senses pull you to whichever developer catches your eye. Listening up developers? This means you have to draw in your audience. Sitting reclusively at your stand, and avoiding eye contact is not pulling in the audience. It was an unfortunate thing to see developers by themselves in a crowded room, but part of that onus falls on their lack of showmanship. Everyone’s tastes are different, and so I can’t honestly say that every booth caught my eye, but there were a couple that really did look appealing. And it’s not because they had a flashy poster. I don’t know how effective all the magnets, stickers, pins and other trinkets are. What I do know is that a game that looks polished, and has a playable demo will draw a crowd. And there were three in particular that caught my eye: A.N.N.E., Dungeon Dashers, and Chasm. It’s tough to talk in-depth about everything I saw at GDC, but out of the GDC Play area, I definitely saw these three games as having some potential. Be sure to check them out because they’re all currently in development, and are in need of your support. So the GDC Expo and Job Fair opened up on Wednesday as well as having one lecture I was able to attend, and the IGF & Choice Awards Ceremony. Maybe I was going in with false expectations… after all this is a conference for developers. It’s not an expo for enthusiasts. That said, there was very little as I walked about that popped out as anything of value. Most booths offer playing cards, pens, balls, t-shirts, and the chance to leave a business card to be entered into a draw for an ipad. It felt like most people were more interested in collecting swag than they were in any given product. On more than one occasion I witnessed someone walking up to a booth, asking for a shirt, and leaving immediately. One area that was very busy was the Independent Games Festival (IGF) section. All the nominees for the Indie Awards were gathered and showing off their games. 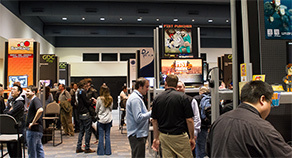 Anyone that was a big shot capable of running a major studio appeared to be on the expo floor either running a booth or looking for solutions to their hardware needs… and anyone who was more of a small fry seemed to be hanging out with the indies playing games and chatting. It was a little sad to see booth babes, but good that they were only at about 4 booths. 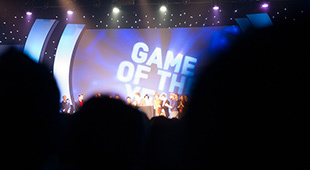 That night was the IGF and Industry Choice Awards. This is the first awards I’ve been to aside from the OIAF, and was a much more entertaining experience than those awards. The presenters had great jokes, were on the ball, the sound and sights were great. It was fantastic seeing the indies getting awards. And while some folk were a little more shy or eccentric than others, it was wonderful to get to see some of these humans where were almost perplexed to be in the limelight. It’s not every day that Gamers are held in such high esteem. If you’ve got a time, go ahead and check out the two videos I liked to. It’s a good watch, and the winners (and nominees!) all deserve their pat on the back. As for the after parties? 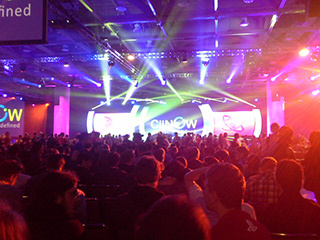 Well… ask anyone and they’ll tell you that the parties are probably as important as any lecture you can go to at GDC. As someone on an Expo pass who can’t get into the lectures… I really should have been going to some parties. But… well, while I may offer criticism to the GDC Play chaps for not being social enough, I can’t say that I’m any better. As vocal as I may be when I have an opinion, I’m also introverted enough that going to parties is difficult for me. Especially if I’ve been in a loud, crowded environment all day. I’m not a partier. Well? I’d already walked around the expo, and none of the Expo level lectures looked like they were particularly appealing to me. 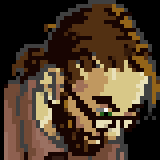 I decided to take the day off from GDC, and began working on “Zombies Are South!“. Yay! 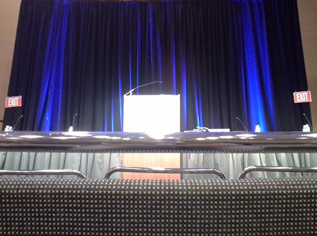 There were some lectures I was able to attend! As I hadn’t done any GDC partying, I was able to get up bright and early and make my way over to a talk by Kris Piotrowski, the Creative Director of Capybara Games. I’m a fan of front row seats in lectures. It was a great talk about the history of the company. I wasn’t honestly that familiar with the company except for their work on Sword & Sworcery which I thoroughly enjoyed last year when it came out, but I felt like it was a great talk for me in particular as it seemed like the beginning of Kris’ career was very much the same as mine. He got into film for some reason he couldn’t place a finger on, and after a few frustrating years had to take the leap and start doing games instead. After that, I hung around for a talk from Conan Bourke who kind of re-iterated my own views on education as well. The important thing is to have ambition, and sit down and do what you want to do. As you work at it, you’ll figure out what you need to learn, and then you set off and learn it. Paying someone for an education and expecting that to be the solution to having a successful career is a bit of a falacy. Nice to hear other people voicing my thoughts. Having already milled around GDC once, I decided to give it one more shot. I mean, I was already there and had time to kill before the last lecture of the day…. so, why not, right? I milled about and tried to see if there was anything that I was really missing out on, and finally decided that maybe there’s a reason that the Oculus was one of the only booths to have a line. So I took a cue from the others there and stood in line. It. Did. Not. End. Or rather, it was long. Or specifically, I spent an hour and a half in line. Was it worth it? Understand that I hate stereo films. I hate wearing stereo glasses over my glasses and getting lights bouncing around. I hate that most film out there is cheated into stereo and ends up looking like card board cut-outs. I hate that you’re back at a distance and have a frame around the images rather than truly getting any sense of immersion. I hate that what looks good to me in film (24fps) looks like crap when you try to get the motion blur in stereo. I hate that if you’re at the theater and you’re not dead center and at the back of the cinema that it starts to look like crap the more you diverge from that standard sweet spot. I liked the Oculus. I’m debating buying a dev kit. I don’t know that I’ll be able to do anything with it for a long time as I have other things on my plate, but it’s exciting. The last time I’d tried VR was many years ago, and CG Imagery has come a long way since then. Graphics don’t all look like horrid vector art anymore, and so the experience actually works quite well. Even with the SD displays that we were demoed there… the fact that the glasses are right in front of your face, and blocking outside imagery really helps with the effect. I look forward to seeing what people do with this, and I’d like to make something with it too. I sincerely feel that the time is right for VR, and that this is where games need to go. 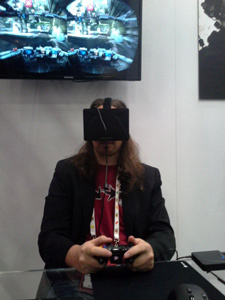 Pair it with a good haptic feedback motion controller for your hands, and I can really see some good games being made. Finally, I was able to end off GDC with a series of postmortems from the devs of the Third Rain Slick Precipice of Darkness, Ziggurat, and Dys4ia. They were all great talks, and I can’t stress enough how awesome it is to get to hear about the challenges that other developers have had to overcome when you’re in the midst of jumping your own hurdles.